A 'Fab Four' star Liverpool hotel. Hard Day's Night Hotel is the worlds only Beatles inspired hotel, combining the highest quality facilities in a truly unique environment. 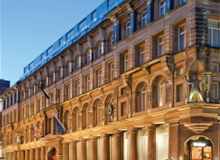 Located at the heart of Liverpool's 'Beatles Quarter' offering luxurious accommodation and exclusive event space with a twist. Housed in the magnificent Grade II listed Central Buildings, dating back to 1884, the beautifully restored hotel is steeped in history. The hotel's restaurant Blake's, named after the celebrated Sergeant Pepper album cover and artist Sir Peter Blake, serves up a range of classic British dishes along with home cooked favourites. Bar Four offers guests a high-end destination cocktail bar, open to all who enjoy that little extra. Sitting adjacent to the world famous Cavern Club where the Beatles rose to fame, and an array of the city's famous Beatles landmarks, the hotel not only offers the perfect getaway for visitors, but is much loved by art lovers, music lovers, and food lovers alike.